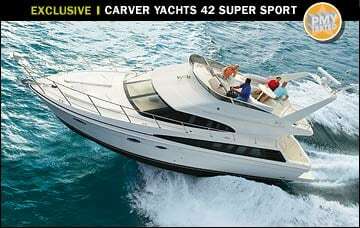 After testing Carver&apos;s new 42 Super Sport powered by Volvo Penta&apos;s Inboard Performance system (IPS), I was slackjaw. They&apos;d harmonized like The Beach Boys on "Pet Sounds." 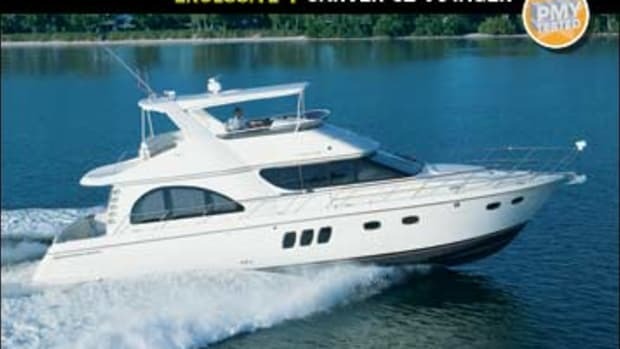 I&apos;ve always admired Carver&apos;s ability to offer the cruising set commodious, home-like accommodations and an impressive list of standards across all of its 17 models. However, my personal experience with running its boats up to this day had been okay. I recall on one occasion wishing I had a more responsive wheel while making some hard-over turns, in addition to looking for a couple of more knots out of my test boat. 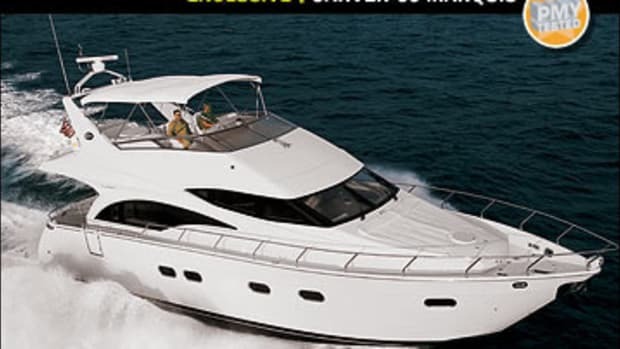 And I&apos;ve always thought that just because a boat is cruising-oriented doesn&apos;t mean she can&apos;t possess outstanding handling and get-up-and-go performance. 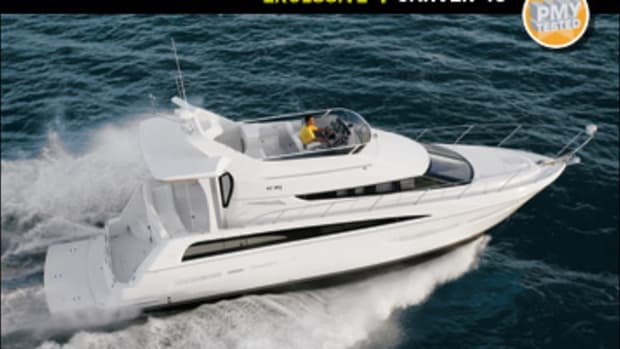 I&apos;m happy to report that after spending a day with this two-stateroom, two-head 42 on the back bays of Lake Worth, Florida, this launch has both of the aforementioned attributes and more. 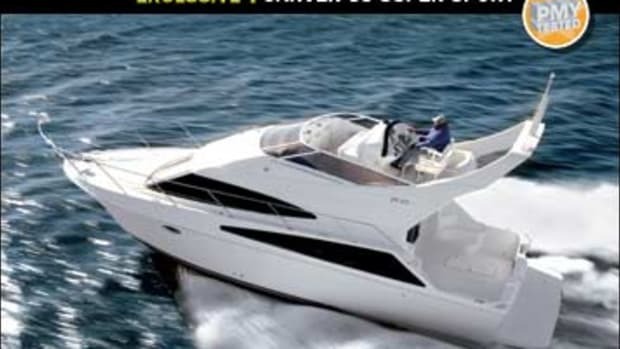 With regards to performance, I recorded a 30-mph (26-knot) cruise speed at 3250 rpm with the optional ($90,785) Volvo Penta 370-hp IPS 500 diesels. And thanks in part to the harmonious workings, the 42&apos;s fuel burn at cruise speed was relatively miserly at 33 gph. With 400 gallons of fuel available, the 42 can cruise speedily for 285 statute miles. If you want a little more wind in your hair (that is, if the optional bridge enclosure is open), just kick those diesels up to 3540 rpm (rated rpm is 3500), and try almost 35 mph at 41 gph. Aside from the impressive speed, the 42 popped out of the hole like an outboard-powered center console. A lot has been written about the virtues of IPS technology, such as improved fuel efficiency, range, and speed, but it also offers something else: easy prop selection. That may not seem important, but propping boats often takes a lot of testing and tweaking. However, Volvo Penta developed a series of prop sets for IPS designated T2 through T10—no dimensions. Boatbuilders basically start with the smallest set (T2) and work their way up until the IPS engines are running at or near their rated rpm. In the case of my test boat, it was the T3s that did the trick. 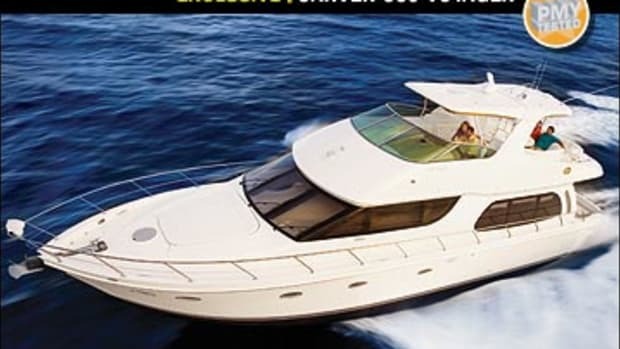 And while the boat ran just a hair more than rated rpm, it fell within accepted tolerances. As Randy Peterson, Carver&apos;s propulsion and systems engineering manager, says, "They [Volvo Penta] have made it real simple for us." After putting my radar gun aside, I had to see and feel this for myself. The first thing I did was flip up the standard bolster seat at the port-side helm station, as I was planning on running this boat fast. However, even sitting at the helm, I found the sightlines clear in all directions. 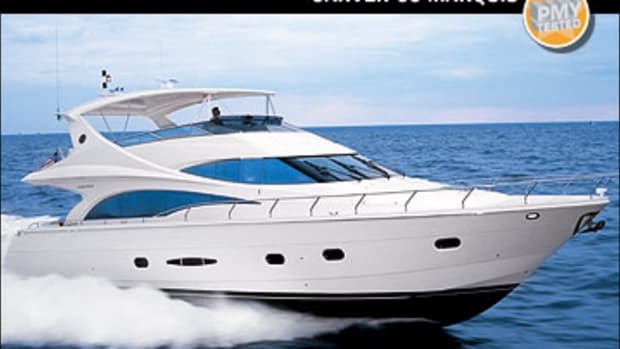 After taking note of an unobstructed path in front of me and with no boats coming up astern, I engaged the single-lever Volvo Penta electronic controls and throttled them full forward. The 42&apos;s IPS engaged without a clunk. With minimal bow rise (I measured a maximum trim angle of 5 degrees), the 42 ran straight and true all the way to WOT. 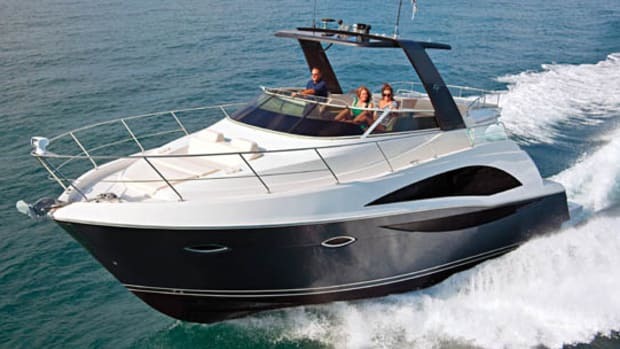 Peterson explained that Volvo Penta had experienced excessive bow rise on some express-cruiser models with IPS, but this was not the case with the 42. And thanks to the directional thrust provided by the drives, my test boat responded in a direct and deliberate manner. Her electronic steering, which at first felt like it was freewheeling, enabled me to turn this boat at speed within just a little more than her 43&apos;7" overall length. I asked Peterson what had been done from a build standpoint that allowed this boat to be so nimble. "The key," he told me, "was getting her longitudinal center of gravity [LCG] right." This required moving things like fuel and water tanks and the genset as far forward as possible to counter the weight of the engines and drives, which are fully aft. Getting the LCG right also made it easier to fine-tune the turning radius on the adjustable electronic steering for maximum performance. Peterson says the steering can be programmed to react from slow to quick, and because the 42 is a flying-bridge boat, Carver wasn&apos;t sure which way would be best. Once engineers realized they could max out wheel sensitivity without excessive heeling or oversteering, they knew everything had come together. But there&apos;s more. The 42&apos;s whisper quiet. I measured only 77 dB-A at WOT (65 dB-A is the level of normal conversation), not too surprising when you take into account Carver&apos;s engine-room insulation, which includes once-inch-thick laminated foam with dense, sandwiched vinyl and a Mylar outer layer. 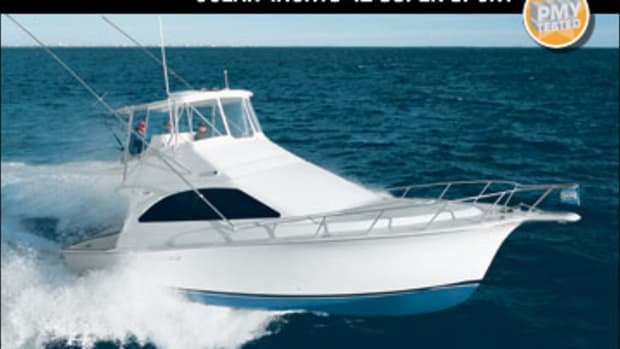 Combine that with a propulsion system that has less vibration than inboard applications thanks to reduced cavitation (the props always work in clean water), underwater exhaust, and drives that are soft-mounted via O-rings sandwiched between the drive housings and the hull, and this makes for one peaceful boating experience, even at 35 mph. But while I was impressed with the 42&apos;s handling and performance, some things didn&apos;t work for me. While the 12-inch-wide side decks eased egress to the foredeck sunpad, upon returning to the 96-square-foot cockpit, I had to twist sideways to get around the flying-bridge overhang and step back down. And the galley countertops are 2&apos;9" high; while this helps make the saloon/galley/dinette one big space and maximizes light from the side windows, it&apos;s too low. Still, the 42 Super Sport has the drive system of the future, which gives it impressive handling and acceleration. But Carver didn&apos;t forget about interior space planning. In fact, because the engines and drives are fully aft, they take up less space than a standard inboard configuration. 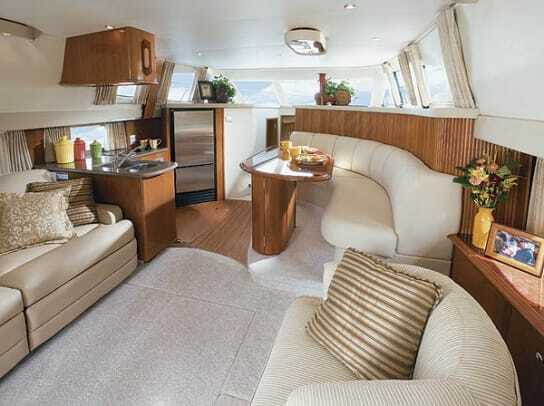 IPS has enabled the builder to expand the guest stateroom, add a second head, and place a washer and dryer under the galley sole, which the original 42 design didn&apos;t have. 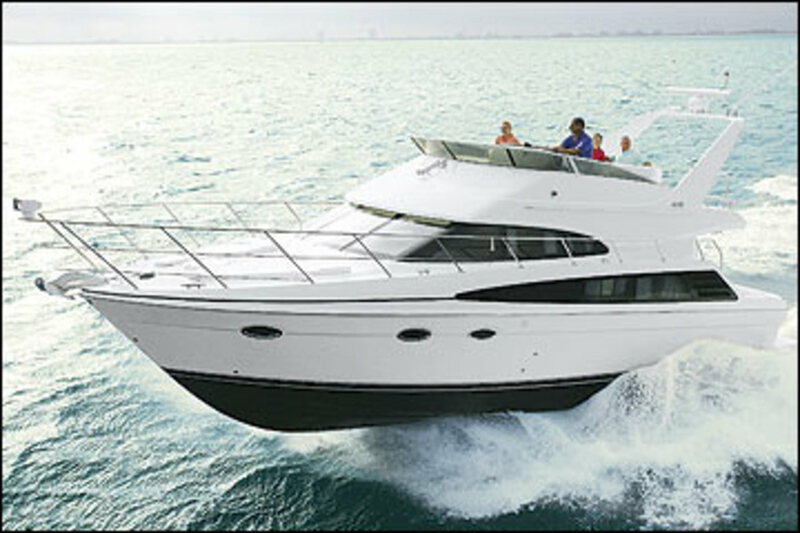 By constructing an IPS boat, Carver has actually provided even more room for cruising families. 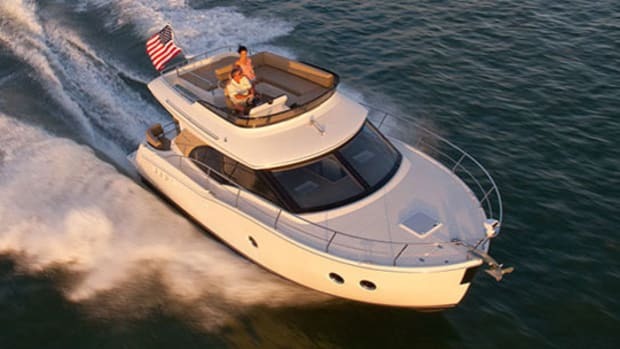 With an impressive list of standard equipment, a warm cherry interior, and that wicked-cool ride, the 42 Super Sport just might provide a little on-the-water harmony for you and yours.